Does a fetus have the right to be born? I was curious if it's normal for people to think such horrible things. I was watching the news today and they had the baby Grace trial going on. The poor girl's mother was laughing and talking with her lawyer after she had helped beat that poor child to death then stuffed her body into an ice chest. After seeing stuff like that very little surprises me. No more appalling than serial killing three womb children. Actually I would say less appalling. Wouldn't killing a preborn child be equally as bad as killing a born child or do you not really think that a born and preborn child are equal? Then why do you keep bumping this thread? Good questions aren't answered very often here from what I've seen, but maybe he'll answer anyway. The only time he posted in this thread was when he quoted faithman to post his spam. I wouldn't call that bumping the thread, but I would like to find out why he keeps posting that spam. Unless you have been deemed by the killer of three to be of less value than the born. Then you can be mercilessly killed. Why should what someone thinks of another person determine whether or not they have the right to be born? Yeah but I thought I'd ask the question and see if an "expert" here could give me an answer. Ask CM. She is the "expert" both in word and deed. Would a moderate Pro-Lifer really be the best person for me to ask? I guess people like that jerk really are rare. That's good. the person in question is no pro-lifer. It is a serial killer of womb children, and constantly take a pro-abortion stance. At the very least it is moderatly borthead. Okay... what's the difference between a pro-choicer and a "borthead"? Besides that? I'm Pro-Choice (I think...I keep getting told otherwise) and don't agree with her much, so theres gotta be some kind of difference. I asked besides that... I guess that means you think pro-choicer = borthead... So, why only "attack" certain bortheads? Have I missed someone? Sorry. But there are varying degreeze of bortheadism. I take every case individually on the merits. Despite the bad press, I do not paint things with the broad brush of general statments all the time. Acase in point, is the accusations that I am anti woman. Simply isn't true. Gender has nothing to do with justice for the innocent. I am most assuredly, and unapologeticly pro womb child/anti killer. It just so happens that some killers are women. And some killers who are women are phony pro-lifers. Every child has the right to be born as long as it doesn't kill the mother in the process. SRUW4I5 I'm curious. Who do those initials stand for in your sig? The idea that anyone has the right to be born is preposterous. There's no such right. No fetus is entitled to be carried to term and be born. Both are equally foul in my opinion. sickos that have already been born. i guess a mother's womb is becoming one of the most dangerous places on earth. It does sound that way. According to what I've read, more children are aborted every year than the amount of people killed in the Iraq war. Hey sicko! They should have that right only after the woman decides to continue the pregnancy. That's when they get that right. Nobody is obliged to continue life or to give birth so their own lineage would continue. Fetuses do not have a right to be born. who gives you the right to breathe, eat, sleep and do all the stuff you need to preserve your life? your mother? the state? the law? someone else? do you think you deserve it? why? My mother chose to have me, my mother chose to give birth to me. At that moment, she gave me the right to life. So yeah, my mom did. And what does deserving it has to do with anything? But personally, yeah, I deserve it. I mean to do a lot more with my life but I've already done a number of things I'm insanely proud of and that I will be proud of for the rest of my life. aborted children don't even get a chance to do anything with their lives. do you think that's fair? No. All persons have the right to life, hence the right to be born. The right to continue your life is given to you by the person who chooses to give birth to you. The moment they do that, the moment they decide to have you and give birth to you, they give you the right to life. To be born, to continue to live - as long as you see fit. Yes. I see no reason why non-sentient, physically dependent fetuses should have any rights (or chances) by default. That's just your opinion. And I obviously disagree with it and I'll never support it. More children are aborted in two days than the amount of U.S. soldiers killed during the Iraq war. So a zygote getting flushed up on a sanitary napkin is as sad as a US solider dying by an IED? The God-given, inalienable right to life is more than an opinion. It is a moral absolute, and it exists whether you choose to recognize it or not. I was including everyone killed in the Iraq war (or because of it) which supposedly totals at a few hundred thousand. Your god is irrelevant to me and everyone else who does not buy into your horrible religion. And THAT's true whether you choose to recognize it or not. A person dies in both situations. The difference in the first situation is that, unless an abortaficient was involved, the child died of natural causes. The woman won't know that there was a concieved child and that the child died, so she won't feel sadness. She won't feel the sadness that she would feel if her son whom she has bonded with for 18+ years is killed in Iraq. Ok. That would be right because there are over a million abortions per year. Either God exists or God doesn't. Either my religion is true or it isn't. If God exists and my religion is true, then God exists and my religion is true regardless of whether you believe. It's under 5,000 abortions per day... So, it would take more than two days. There was an estimate a few years ago that by 2009 there would have been 1.1 million people killed because of the war (it included deaths due to the effects of the war). It was only an estimate, so it probably isn't right. A mothers children are her first right and obligation. I disagree. Children are a privelage not a right. If you treat them badly, you lose the privelage of having them. Very true. But you have to ask yourself, given the millions of different Gods people worship (even in Christianity), what are the odds that you've picked the right one? Sorry, I wasn't clear. I meant that you are right that there are more children killed via abortion in one year than in the total Iraq war. Oh okay. That was just my response to the two day comment. It is a womans right to have children. If you abuse that right, others have the privilege of taking those children away. It is a privilege. If you abuse a child others have the right to take the child away from you (as long as they don't break a law to do it). No. Living is her first right. That's why abortion to save her life is justifiable. Children are a privilege as others have said. And those that advocate abortion will use anything to define what it means to "save her life". 96% of all abortions have nothing to do with the health or welfare of the child or the mother. Any those that advocate abortion will use anything to define what it means to "save her life". What about the four percent that really do have something to doe with the health or life of the woman or child? I think if a group of doctors agree that continuing the pregnancy will kill the woman that an abortion could save her life. Do you atleast agree with the religious people that say that instead of aborting a tubal pregnancy the whole tube should be removed? That way the woman doesn't have an abortion and won't die. the medical comunity should never be given the "right" to kill. Ever effort should be taken to save both. But if one is lost in the process, it is very unfortunant. Mordern medacine makes abortion almost completely a mute point. Abortionist is healer turned killer, and that should never be. Sometimes you do have to choose which one to save. I'll ask you the same thing I asked him. Tubal pregnancy; remove the child, who cannot live in this circumstance or remove the tube with the child who cannot live in this circumstance. I see no real difference since both options cause an earlier death other than hindering the potential for future children for the sake of being able to say, "I did not have an abortion". Whether that makes you feel better or not, it does not change the outcome as I understand it. 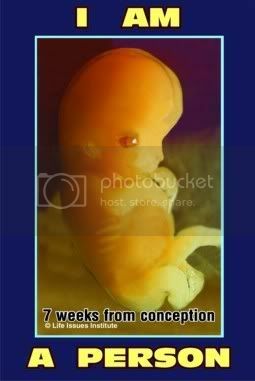 There is a difference in destroying the embryo and removing the tube or part of the tube. One is a direct attack on the embryo or fetus and romoval of the tube is not, and the embryo or fetus dies as an unintended consequence, which is consistent with the principle of "double effect" and Catholic ethics. And those 96% should be illegal. How can anyone believe that the removal of a tubal pregnancy can be preceived as a "direct attack" on the unborn child since the removal is done first in regard to the welfare of the mother and not with the detriment of the child in mind? The intention of the medical action chould determine what is permissable or not permissable in these specific instances. The person that said that on the Catholic site probably believes it is an attack on the preborn child. I think whatever is best for the woman should be done since there is no way the preborn child could live. "The right to continue your life is given to you by the person who chooses to give birth to you. The moment they do that, the moment they decide to have you and give birth to you, they give you the right to life. To be born, to continue to live - as long as you see fit." So you will tell your daugther that? I gave you the right to life, you should kiss my boots for your very exisitance because I could have aborted you just like that? You and my mom should get together for coffee sometime.. you two would hit it off wonderfully. Unless a woman wants to risk internal bleeding she won't continue a tubal pregnancy. Since the child won't be able to live no matter what way its done, what's wrong with removing it in the way that is best for the woman (and has the lowest chance of complications)? I'm not aware of any surgical procedure that has any advantages that would make it "better for the mother" to treat the baby with disrespect. Are you? What's the respectful way to do it then? What is best for one woman isn't necassarily best for another. That's why I leave it at what's best for her. Afford them dignity, and implement any and all appropriate life saving measures. There is another human being to be considered, even if that human being has only a slim chance of survival. To treat that other human being like a cancerous tumor is immoral, IMHO. I'm all for doing that if there is even the tiniest chance both can be saved. But in cases where they can't, I believe it should be done in the way that would have the best outcome for the one that can be saved. There is ALWAYS the tiniest chance that both can survive. Just because no human baby has ever survived at three months is no proof that the next one cannot. It's called "giving them the benefit of the doubt", and it doesn't cost a thing. Would you really deny them simple human dignity just because no other baby that young had survived? What about a prisoner on death row who had exhausted all appeals? Would you have that prisoner abused simply because he had no chance to avoid being executed soon? Or what about a terminally ill patient? this "fine point" discussion is a good and nessisary one. the thing is, that if we don't protect life, then our life is in jeaperdy. We can not give doctors the right to kill, and be safe while under their care. I wouldn't have a prisoner abused or a terminally ill patient. In an ectopic pregnancy the preborn has no chance of survival. It would rupture the tube it's in, which would cause internal bleeding, and leaves the woman with a 50/50 chance of surviving. Supposedly that kind of pregnancy is on the rise (and theres supposedly 100k of those a year). Any other case we should try to make it possible for both to live. That's what I've been saying, and what I believe. And just how many of these women who have ectopic pregnancy, also had elective abortions before hand? the reason this is on the rise, is because elective abortion causes a woman's body to malfunction. You can not do wrong things, and expect the future to go right. It's that little reap what you sow thing. Then why would you abuse an unborn human? Not true, there are records of the survival of ectopic babies.. Even when it's not clear that both can live, the baby deserves to be treated with respect. That's what I'm saying. Why gamble with a woman's fertility in order to "not abort" a pregnancy that CANNOT BE CONTINUED anyway? Removal of a tubal or abdominal pregnancy is NOT AN ABORTION - it is the medical treatment for a pregnancy that is developing OUTSIDE THE UTERUS, a pregnancy which is DOOMED. Why not at least give the woman another chance to have a child? You honestly don't care AT ALL about the life of the woman, do you? In the case of a tubal or abdominal pregnancy, THE PREGNANCY IS DOOMED. IT CANNOT CONTINUE without causing death or permanent, serious injury to the woman. This is one of the VERY RARE instances in which an unborn child MUST be removed from the mother, resulting in the death of the child, because the pregnancy CANNOT BE CONTINUED. Early diagnosis and treatment of salpingitis and PID"
OK miscreant scanc. Show one post where it says I don't care about the health of women? You are the one who slanders not me. That's all she's got. Without slander, she would have to shut up. Some ectopic pregnancies can be treated with medication, which is much less invasive and much safer for the woman. Insisting surgery must be done so as not to directly attack the child or to afford it dignity is outrageously immoral since the child will die anyway. The mother's health must come first in this instance. I've tried to get a straight opinion from you about this several times, but to no avail. Care to give one now? Or would that just elucidate further how anti-woman you are? It might cost the health or life of the woman. Oh, but you don't care about that, do you? In the abdomen, yes, but please provide evidence of an ectopic surviving in the fallopian tube. Yodavater thinks it's OK to let a woman die to try to save a fetus. Because these guys don't care one jot about women. Women who they know, can talk to, can see, have shared experiences with perhaps. No, they care more about an unborn child they've never met. They're basically saying they'd rather save a stranger's life, health, fertility than the woman they know/love.